I’ve recently been extoling the virtues of Joseph Nolan’s recordings of the Widor organ symphonies on the Signum Classics label, with the Symphonies 1 & 2 here, and 3 & 4 here. These have been my main references when evaluating Schmitt’s performances, but before indicating any preferences I should add that both are very fine – they are however in many respects like comparing chalk and cheese. This in some respects is down to the differences between the two instruments used, Nolan’s playing of the Cavaillé-Coll at La Madeleine in Paris creating a very different atmosphere. Take for instance the Méditation from the First Symphony. Nolan is able to create a magical halo of harmony around Widor’s innocent sounding melody, where Schmitt’s accompaniment is more reedy and direct. This is one movement in which the two players agree more or less on tempo, but Nolan’s more expansive take on the music often puts him well over Schmitt’s timings. This is something you may or may not like, but after hearing Nolan there is the feeling with Schmitt that you are waiting for something to ‘happen’, a sense which is not dispelled by more conventional tempi. Take the Salve Regina from the Second Symphony, and not because it is particularly eventful. Nolan’s version begins with stealthy sonorities and a sharp contrast in stops between the running figures and the counterpoint which interrupts. This builds a sense of expectation which Widor confounds, constructing cadences which promise a grand climax but are wrong-footed by ecclesiastical rumination. We are only released in the final minutes through celestial upper harmonies and a throaty final melodic statement in the pedal. This is one instance in which Schmitt is actually a little longer in duration than Nolan. His opening figurations are more full-on, and I miss that sense of anticipation which I feel from Nolan. The run-on to the churchy counterpoint is lacking in any real sense of contrast in sonority, and the whole thing is more flattened out as a result. The magical closing minutes are relatively heavy – more ‘organ’ than ‘music’ for my taste. 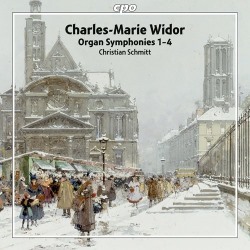 This is by no means a poor performance and I’m not enough of an organ expert to be able to lay my comments at the feet of the player or the instrument or the composer’s instructions or even the microphone placement, I just know which, to me, delivers more a feel of Widor’s quirky purposefulness. Sound quality is always an issue raised with organ recordings, and I very much enjoy the richness brought out by the CPO engineers for this release. The Rouen instrument is one which delivers a terrific all-round sound when at full roar, though you will probably have heard deeper and more trouser-flapping bass from other organs. The Marcia of the Third Symphony is one such place, but even with SACD sound the harmonic definition is by no means as clear as with Nolan. That authentic French pungency is very much a quality you will find in Rouen, though La Madeleine proves itself more insinuatingly nasal in the Prélude which opens the Third Symphony. There is greater definition between registers in Nolan’s recording, and more elegance in his melodic shaping. When a lyrical moment pops out in this Prélude you get a little ‘ah’ of surprise, a welcome lift from all that surrounding darkness. Schmitt is impressive, but you can wait until the end of the movement and then maybe hope that you’ll hear something further along in the work. This is what I mean about things ‘happening’. We have impressive performances from Christian Schmitt, but in comparison with Nolan we all too often rumble along with tank-like reliability rather than being constantly made aware of the remarkable details and beguiling corners to be found throughout these works. I think it’s fairly clear which recordings I would be recommending if I was still working in a CD shop, but it’s worth looking at the Fourth Symphony, the opening of which is one of the more familiar Widor statements in this set. That Toccata is taken at pretty much the same tempo by both players, though you will hear it faster elsewhere as a rule. Schmitt is the swifter by a hair, though his articulation and the space between those mighty chords is filled by the larger Rouen acoustic. This environment is superbly grand, but is no doubt a factor in making the definition in harmonies and sonorities less easy than in La Madeleine, which is also by no means a miniature space. Schmitt’s shaping of the Fuge which follows is beautifully expressive without wallowing, one place in which I would argue Joseph Nolan’s tempo is a tad too slow. Nolan is actually swifter in the Scherzo, but there is not a great deal to choose between the two, other than that the intricacy of detail is more easily followed in the Signum recording. Nolan makes more of the vox-humana nature of the start of the Adagio, and while I enjoy both you wouldn’t necessarily identify Schmitt’s version as an adagio, coming in a good 30 seconds faster and alas not making the most of Widor’s most expressive moments. So to conclude, this is a fine opportunity to hear one of Cavaillé-Coll’s best instruments in its original condition, and if you fancy giving your SACD set-up a decent workout this is a good place to explore some remarkable organ music in highly respectable performances. I’ll certainly be hoping for a completion of the Widor cycle from this quarter, but if I was buying now it would be Joseph Nolan on Signum Classics which would still be my first choice for sheer musical delivery.